Make your own Chinese takeout at home, using quality meat and your favorite vegetables! 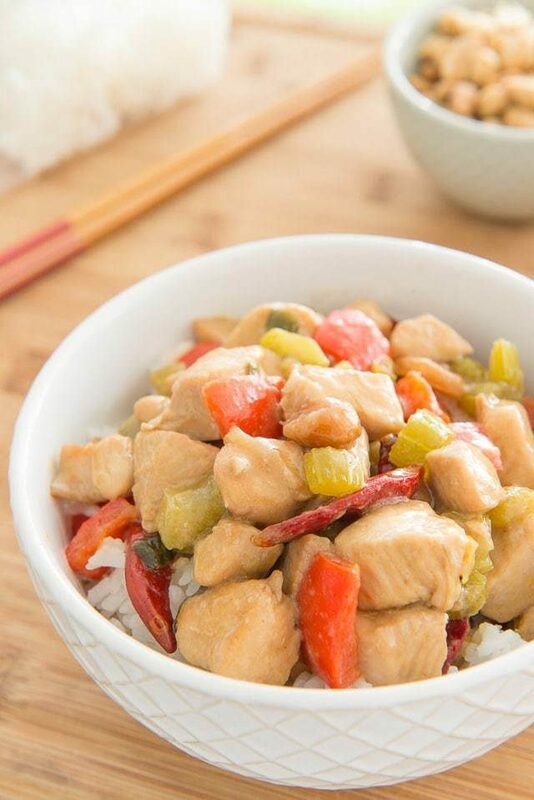 This Kung Pao Chicken is quick and easy to make, perfect for a weeknight meal. Making Chinese food at home for myself came out of necessity. As crazy as it may sound, I have found very few Chinese restaurants that I find worth going to. So when a craving strikes, I often end up making the dish at home. At worst case, maybe it involves breaking out the fryer for something like Honey Walnut Shrimp or Orange Chicken, but it’s always worth it. 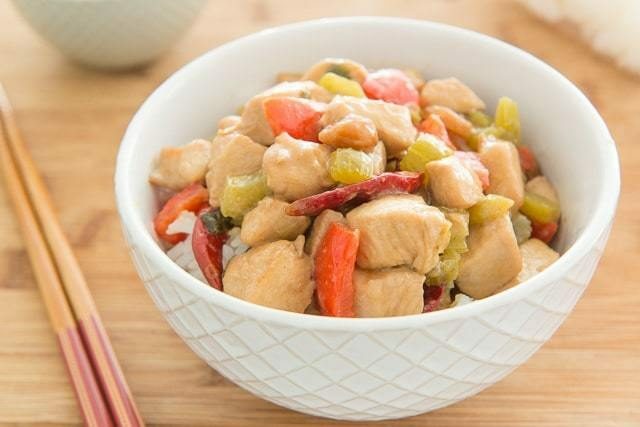 Chinese food is usually pretty easy and quick to make, provided you have the ingredients. When you add all of that up, you end up with a convincing argument to make Chinese food at home too! 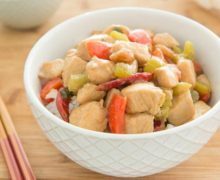 Kung Pao Chicken is one of the most popular takeout dishes of all, and basically it’s just a stir fry. It involves stir frying different ingredients in batches, then bringing everything together at the end with a sauce. It’s one of the healthier Chinese recipes, which is a feat because a lot of Chinese foods are fried or very sweet. Not the case here! 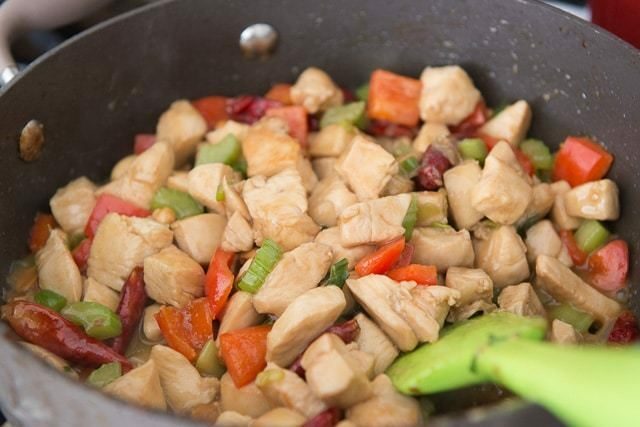 To get started, toss chopped chicken with soy sauce, cornstarch, and rice cooking wine. Let that sit while you cook. Then toss everything around frequently for another 2 minutes, to almost finish cooking the chicken. Cook for a few minutes until crisp tender. Stir everything around for 2-3 minutes, to finish cooking, and also thicken up the sauce. Cut the chicken into bite sized pieces, about an inch big. Whisk to combine the cornstarch, soy sauce, and rice cooking wine, and add the chicken. Toss to coat, then let this sit while you make the rest of the recipe. 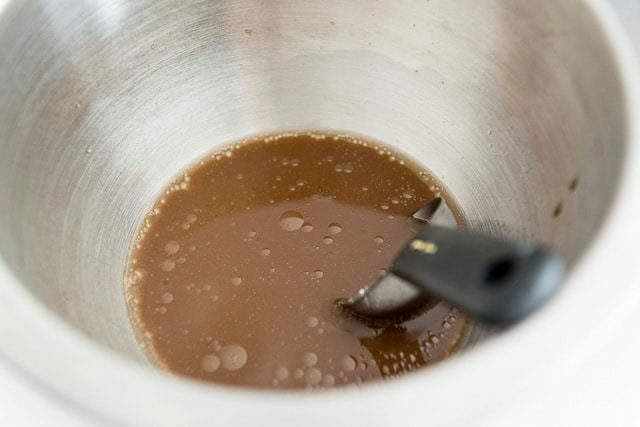 For the sauce, whisk together the black vinegar, rice cooking wine, sugar, sesame oil, water, and cornstarch. Set aside. 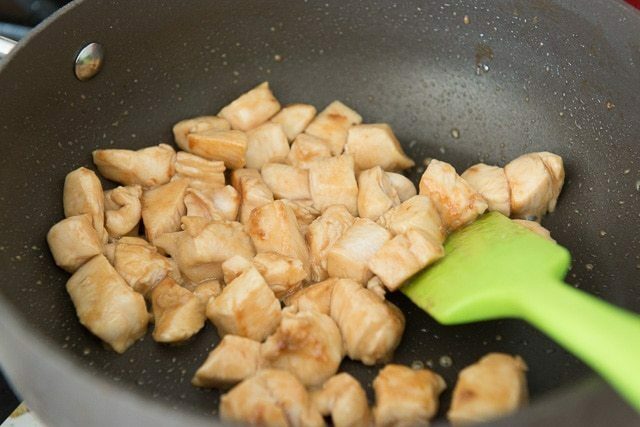 Heat a wok or high sided skillet over medium high heat, then add one tablespoon of grapeseed oil. Add half the marinated chicken, and let sit for 1 minute, without stirring, so the chicken can brown. Then stir the chicken and continue cooking for 2 minutes until the chicken is mostly cooked. 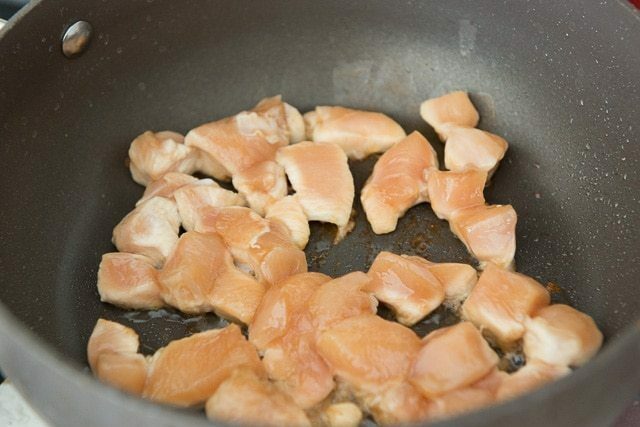 Remove the chicken from the pan and repeat with the other half of chicken. After removing all the chicken, there should still be some residual oil left in the pan. If not, add another tablespoon. 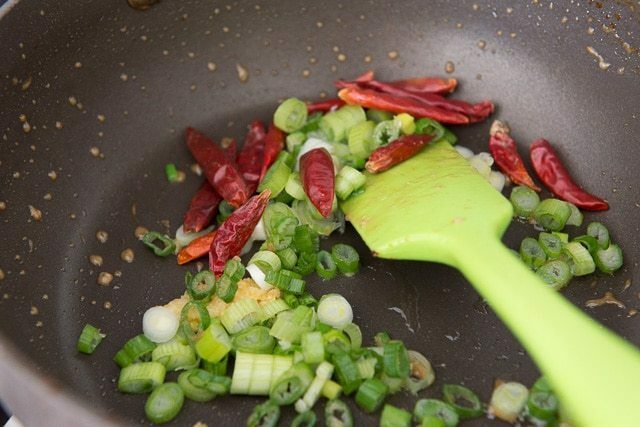 Add the garlic, ginger, scallions, and chiles, and stir for 30-60 seconds, until fragrant. 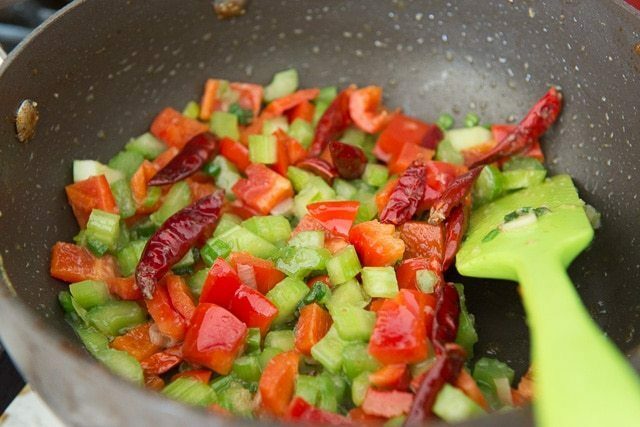 Add the bell pepper and celery, and cook for about a minute, until slightly softened. 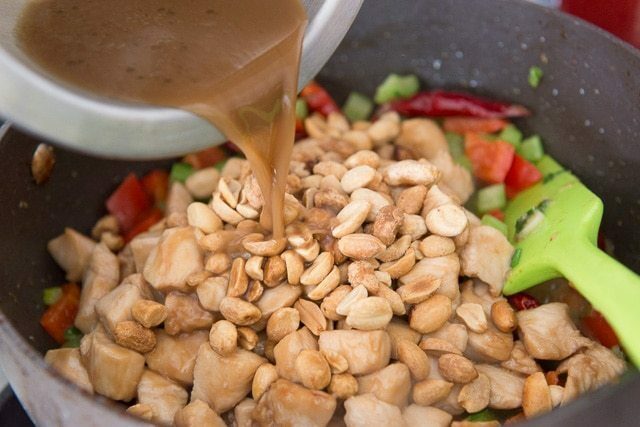 Then add the mostly cooked chicken, the peanuts, and the sauce to the pan. 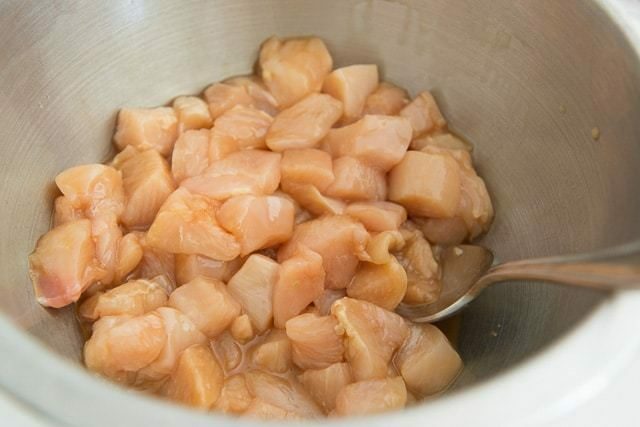 Cook for 2-3 minutes, stirring the whole time, until the sauce thickens and the chicken is completely cooked through. Serve hot with rice, if desired. Can sub shaoxing cooking wine? So quick and easy! I was able to get the black vinegar online. Just like the restaurant but with better meat!